Marriage is hard. It is easy to understand why couples decide to call it quits. It is perhaps easier to be alone or to try to find someone else who has the characteristics your spouse doesn’t have but that you wish he did have. Of course if you find that someone else, that other person will be missing some other desirable characteristic. And while your own problems/issues/neuroses may be masked in the euphoria of a new and different relationship they will reemerge sooner or later, leading to serial monogamy without the joy of a deeply committed and evolving marriage that weathers the challenges. For my young readers who believe in the romantic notion that there is only one soulmate to hold out for, bah! Disabuse yourself of that ridiculousness. No one person is your perfect mate. But do choose wisely. Choose someone who is responsible and loyal, loving and funny, a partner in parenthood (should you decide to have children), a friend, and someone who gives you that frisson of passion, even after 21 years of seeing you at your worst. And at your best. 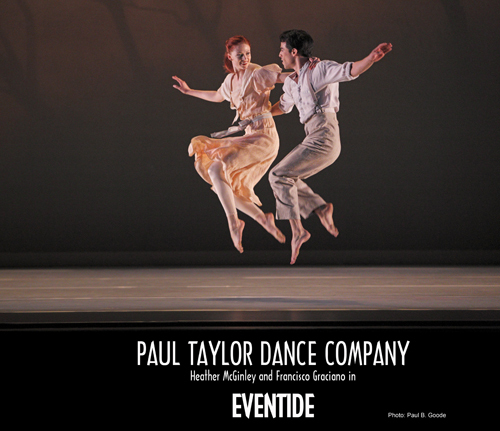 I saw the Paul Taylor Dancers perform Eventide. I went with my 20-something niece who is at the age where some of your illusions have been burst but you don’t quite know who you’re going to be yet. An exciting and hopeful and confusing age. (Aren’t they all?) I didn’t go with my husband, because enjoying dance performances is one of the characteristics I wish he had but he does not. It is a very beautiful dance that a 20-something can enjoy, but may require being 50-something to appreciate. Paul Taylor choreographed Eventide when he was my age. Interesting. It opens with 5 couples. (All male-female, which is notable because Taylor has made so many wonderful dances for all sorts of combinations of people!) In the beginning, the couples look the same and move in unison to the same choreography. And then. Each couple dances their dance. The story of their relationship. Or perhaps it is five phases of one relationship. There is the woman reaching for another lover while her partner movingly invites/pleads/demands that she stay with him. Compliant, she tries to stay, but her body language is distant and resistant. Their dance ends with her tragically alone, with neither lover. There is the woman returning to her lover apologetically. Can he forgive her? Can he trust her? Can they love again? Cautious. There is the couple ecstatic in new love. Each movement thrillingly joyful, in unison, inseparable. Haven’t we all been there? The excitement of new love where you can’t bear to be apart. The temptation of another love or another path that promises to be different, better, more right. The unequal balance after one partner hurts the other, betrays the other. The deep comfort and bond and friendship and simmering passion of a long marriage. If the beginning of a relationship is an ecstatic dance in unison, the eventide of a relationship has more complex choreography. Frequently, after the kids arrive, you divide and conquer, creating parallel lives that forget to intersect. When the kids leave, you’ve forgotten how to intersect. The dance moves from unison to parallel solos to, if you choose, a wiser mature love with special moments of intersection and connection. You may need to revisit some of those earlier dance steps in order to remember. My husband and I are looking to weave back together. We have each changed after 21 years of marriage and our relationship has changed. Sometimes we marvel at our longevity given our many differences. It seems to work best when we treat each other like we love each other. To talk, to listen, to hold hands, to look each other in the eye, to laugh, to be proud, to compliment each other, to be polite, to be kind. We’re revisiting things we liked to do when we were dating, like finding new recipes and cooking together. Then we go our separate ways. And come back together again. It’s a dance.